It isn’t a secret that I love Rhônes, whites and reds alike, so reading the wine list for a recent tasting with Turtle Rock Vineyards already whet my palate. Paired with another multi-course lunch created by Chef Kenny Spost of the Napa Valley Grille in Westwood for the #LAWineWriters group I’m in, the table was proverbially set. But first, we learn about and taste the wines. From Turtle Rock owner, Claudia Burns, I quickly discovered that her husband Don Burns came from a caliber of winemakers to respect: He was and continues to be the assistant winemaker for Saxum Vineyards – obtaining many of his wine grapes from the same vineyards – and he works on both wines simultaneously in the Saxum caves. If it’s punch down day for Saxum it’s also punch down day for Turtle Rock. The Burns’ also co-own the Wine Shine distillery I visited a few years back. Both Turtle Rock and Wine Shine have tasting rooms in Tin City, Paso Robles. 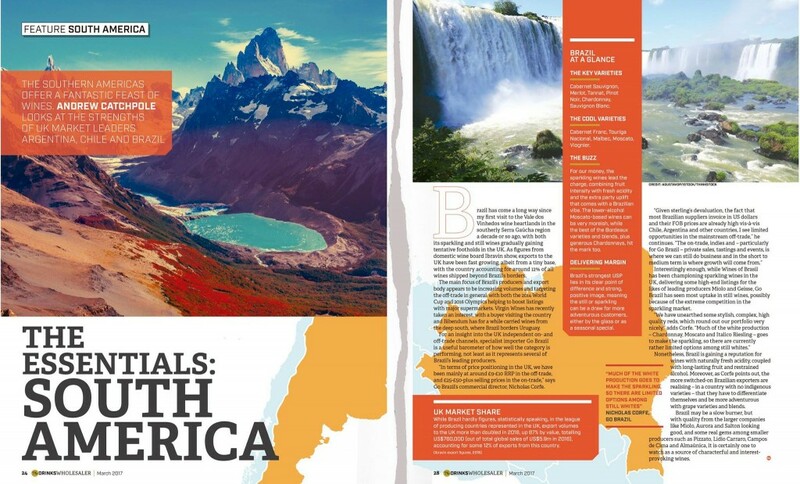 If you are salivating already, check out the two photo grids here. On the nose I got lemonade, popcorn kernel, unsalted butter and toasted oak. The taste gave way to flavors of lemon, peach, apricot, kiwi, green apple with a mild acidity allowing for a lingering finish. 2015 was their first vintage from Plum Orchard, and the sandy soils allow for a “filtration system, a leaner wine…” they then added “stem tannins (to) accentuate the spice.” Aromas of black cherry, black pepper, plum, dark chocolate, forest floor, leaves and sage. On the mouth I got fresh dark fruit, killer spice notes, pepper, very rich. Stewed fruit, plums again, creamy milk chocolate, white pepper and toasted oak on the nose, followed by flavors of ripe berries, spice and cracked black pepper. A wonderfully balanced nose of both fruit and spice. Also felt a velvety quality, blue to black fruit, tri-color pepper, char, sweet chocolate candy, oak and a whiff of cigar wafting through it all. Tasting the wine, knowing from the nose I would love it, I found that it was filled with bold dark fruit, had a dusty quality, lots of spice and again, with a great balance. Surprise Wine: 2016 “Maturin” (The name is an ode to a Stephen King horror series that references a turtle). 50% Syrah, 32% Graciano*, 18% Grenache. Wine Club Only. Aromas of blackberry, rich earth, mint and cream. On the mouth I loved the dry, richly layered qualities that also included lots of pepper and spice, dark fruit and tannin that allowed for no end to the finish. Seriously, the fruit and the spice just went on and on. That’s what I call a welcoming wine. * Graciano was FKA Mourvedre in many Paso Robles vineyards until very recent. It shook things up a bit. This is just one article about it. For the Willow White: Harvest Salad, roasted butternut squash, green dragon apple, glazed walnuts, baby kale, feta cheese, maple-olive dressing. I couldn’t get enough of this salad. Every bite had so many enticing flavors. The wine was the perfect accompaniment; both had those notes of green apple. One of the other writers commented “good start” and I had to agree. For the Plum Orchard: Cast iron seared Branzino, toy box summer squash, red plum jam, fennel-arugula salad. Loved the plum in the dish that matched up perfectly with the plum I had found in the nose of the wine. For the Willow’s Cuvee: Oven roasted Duck Breast, roasted cauliflower, port wine glaze. Again the flavors Chef added – specifically the glaze – was perfect with predominately Grenache driven blend. For the G2 Syrah: Petit filet, Bing cherry red wine demi glace, truffle mashed potatoes, fat rendered breadcrumbs. Oh boy, saving the biggest wine for the steak was, of course, perfect for my palate. 2016 Willow White: Aged in 20% new French oak to give a touch of creaminess. The remainder was aged in 40/40 stainless and neutral French barrels to preserve the minerality and crispness. The nose gives way to fresh stone fruit, lemongrass and flower petals while the palate is of Granny Smith apple and dried kiwi. Cases produced 106. Drink now to 2022. G2 Vineyard, Plum Orchard, Windrock. 2016 Plum Orchard: The Plum Orchard vineyard is in the Templeton Gap District and is made up of sandy soils. It sits near a creek bed which provides minerality, spice, and purity of fruit. We did 50% whole cluster fermentation for added weight and complexity and aged for 22 months in neutral French 400L barrels. It’s a gorgeous wine with a silky texture, bright red fruit and a bit of white pepper and herbaceousness. Cases produced 104. Enjoy now until 2028. 2015 Willow’s Cuvee: We added just a touch of Carignon for tannin and structure to our usual blend of Grenache, Syrah, and Mourvedre. We did 20% whole cluster fermentation on the Syrah and co-fermented the Grenache and Mourvedre in concrete. All was aged for 22 months in 50% new French and 50% neutral French barrels. This wine is soft with notes of blackberry jam and violets that are truly fresh and balanced. Cases produced 183. Enjoy now until 2028. 2016 G2 Syrah: This vintage is beautiful and very deep in color. We did 30% whole cluster fermentation and aged for 22 months in new French oak which gives complexity and structure. Black and blue fruit coupled with smoked meats. There are lively herbal notes accented with warm spice. This unfiltered wine has great tannin, intensity, and a long finish. Cases produced 312. Enjoy now until 2032. Greetings! It has been said that there is often more than meets the eye. This is certainly the case of Soave, home to Italy’s leading white wine of place. Soave dates back to 1931 when, along with Chianti, it was among the first two regions to be geographically delineated in recognition of both its impressive popularity and importance to Italy’s wine market. Fast forward some 80 years later and we find this dynamic region is again flexing its muscles, led by terroir-driven Cru bottlings and complex hillside efforts which, when complemented by the lush dessert Reciotos and small amounts of bubbly (yes, there is Soave Espumante), paint a much more complex picture than what meets the eye! Soave is a key DOC in the Veneto and is the most heralded white wine region in Italy. In fact, Gambero Rosso reviewed over 100 Soaves for 2015 (as opposed to just six in 1991) and awarded five Soaves with the coveted “Tre Biccheri” designation. 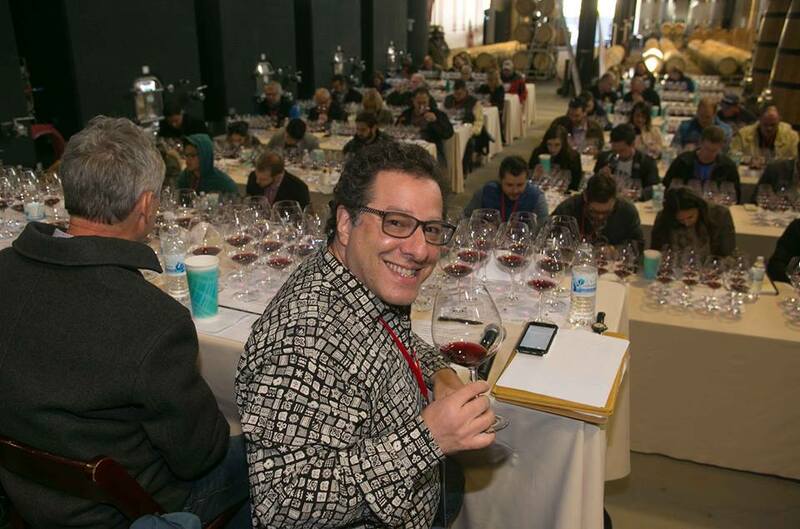 Evan Goldstein MS, not drinking Soave wines, photo from his public Facebook page. Led by Master Sommelier Evan Goldstein and Soave Consorzio Tutela’s Goivanni Ponchia, we did what Goldstein called a “kick start blind tasting” of ten wines to begin my education. Best to have them fresh and cool rather than sitting in front of us for a while, in what Goldstein called a “Sadie Hawkins” tasting, and then have the lecture afterwards. Ponchia agreed with Goldstein, that the wines should be tasted cold. We would taste 17 in all by the end of the lunch and the conclusion of our 3 1/2 hour tour of Soave. As I would have zero chance whatsoever of making an educated determination of which wine was in which glass I looked for general aromas and flavors that I found in most. 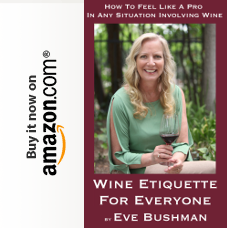 I was sitting at the big kids table of experienced wine buyers…slightly intimidated by some snobbish remarks towards others but I muddled through. Color: All clear, with varying degrees from pale yellow to pale gold. Aromas I found: Peach, pineapple, creamy unsalted butter, jasmine, brown butter, lemon zest, lemon furniture polish, browner/darker ones had some hay/oak aromas, and some were more pungent while others had a paler taste. Flavors: Acidic, viscous, tropical fruit, pineapple spears, lemon, green apple, hint of cherry, pink grapefruit, medium acid, seemed low in alcohol overall. Our last wine, #10, must be their version of a late harvest or made from grapes with Botrytis. Caramel, butter, cling peaches and candy apple on the nose followed by a full mouthfeel of honey and buttered popcorn. Conclusion for Wine 101ers: I found that the aromas and flavors were very similar to a Sauvignon Blanc but with much less annoying acid and more fruit. Would be lovely cutting through a sharp cheese or creamy pasta sauce, and equally nice with a chilled seafood salad or fruit compote on pancakes. Wines Revealed Were From: Latium, Stefanini (about $12 retail), Cantina di Soave (1 of every 2 bottles made in Soave and the greater area is from Cantina di Soave and the one we tasted retails for about $15 retail), Cantina de Gambellara, Sandro De Bruno, Cantina del Castello (used to use barrels now only stainless steel vats, volcanic soil, $17 retail), Vincentini Agostino (gets 40 tons per acre), Gini, Monte Tondo and Franchettto. Our sparkling was from Riondo, retailing at $9. Soave is near to Verona if you are visiting Italy. Ponchia said there are two main DOCG municipalities, Soave Superiore DOCG and Recioto Di Soave DOCG. About 82% of Soave is exported; in 2002 more was added to DOC production (see map). Delineations are not yet noted on labels as not to confuse consumer. Goldstein explained a little history of the wine. There is an iconic castle in the center of the town of Soave proper. Soave was the leading white wine while Chianti was the leading red. The Cru system was revisited in 1971 on the labels. Also in the 70’s names, like Soave, took off and became wildly popular. “Now is the time to re-impress people,” Goldstein said. Four percent of DOC wines from Italy are under the Soave appellation. There is rare barrel use and the wineries are pushing a sense of place and terroir. Goldstein recommended that we all read the thick text, “Native Wine Grapes”, as it’s the best comprehensive lesson on Italian wines. The grape, Garganega, “is a chameleon” in that it’s an old and prolific grape. Some chardonnay was planted but it’s not on the rise in Soave. Vines are not pulled out and replanted at a 30 year prime; instead they can go 35 to 40 years, some over 100 years, before the winery chooses to replant. A Soave mush have 70% Garganega, and only up to 5% of any other grape varietal may be added. The soils in Soave range. They can be dark volcanic on northern and eastern parts, and produce richer wine that requires more time for ageing; while the southern and western side is calcareous, producing a more linear and floral taste, and ripening earlier. Pair with: Pesto based foods, citrusy/sharp ingredients, light meats, light sauces, desserts with marmalade, dried fruit, toffee or nuts. The first course, calamari and shrimp, was served with a 2014 Dal Cero (sweet pear flavors) and the 2014 Fattori (tangy grapefruit). Our second course, Risotto with sausage and Parmesan cheese, was paired with a 2013 Casarotto (acidic lemon-lime) and 2013 Suavia (peach and pineapple). The third course, Veal Scaloppini, Prosciutto and Sage, was alongside a 2013 Marcato (honey and cantaloupe) and 2013 Cantina di Monteforte (pear and sweetened green tea). 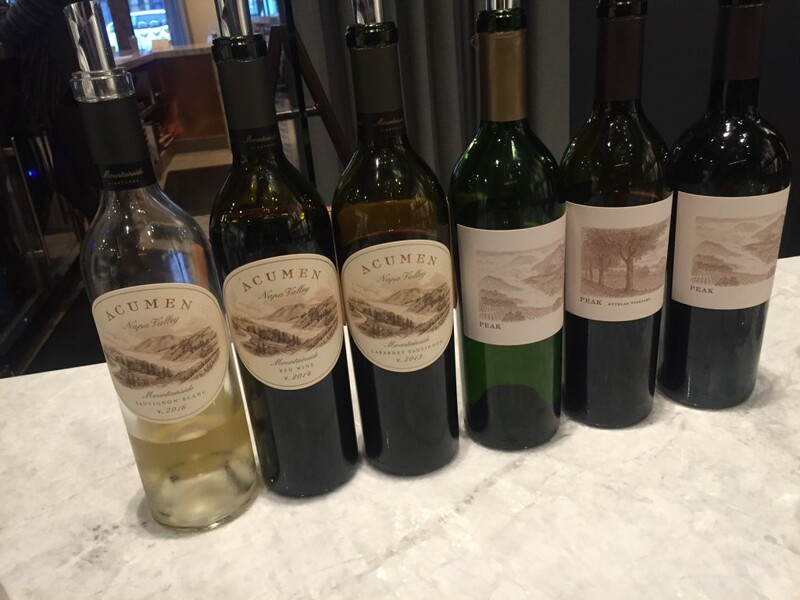 In a leap from the standard expectations in a winery tasting room, Acumen hosts seated tastings in a bright and modern wine gallery. The large original paintings frame the tasting room, each with a splash of white to mimic Napa fog, as you settle in with wine glasses, tasting notes and an invitation to become a member. That fog is very abundant in Acumen’s vineyards, as explained to us by Marian Jansen Op De Harr, the estate Ambassador, as they are 1350 to 1600 feet up, in a remote section of Soda Canyon Road. Marian led us through a tasting of six wines, each apparent to me were done in a lower alcohol, less bold style and more in a Bordeaux style. Our first, a 2016 Mountainside Sauvignon Blanc had little oak but great fresh fruit and body. The 2014 Mountainside Red Wine blend, predominantly of Cabernet Sauvignon followed by Malbec, Merlot, Cabernet Franc and Petit Verdot, was big and dry. Next came the 2013 Mountainside Cabernet Sauvignon, which is predominantly Cabernet fruit from the valley floor and meant to drink now. The 2014 PEAK Sauvignon Blanc from the Stagecoach Vineyard blew my mind –great fruit, low acidity and the small amount of oak aging made this a stellar white Bordeaux style. Only 95 cases were made. Then we sampled the 2013 PEAK Attelas Vineyard Cabernet Sauvignon with 84% cab fruit was big, beautiful, perfumy and velvety which Marian said was due to the cooler climate in the vineyard. Our last wine, the 2013 PEAK Cabernet Sauvignon tasted more of redder fruit to me at first sip but darkened in the finish. All of these wines were their first vintages, most hovering below 13.3% alcohol – in the low end for some standards but not for Bordeaux. Acumen is working on getting a new winery with wine tasting approved for their vineyard property in Atlas Peak. It’s been a battle and they’re in the midst of a lawsuit right now. Winemaker Henrik Poulsen also made an unexpected appearance, settling in for a bit to sip some of his exquisite PEAK Sauvignon Blanc, and recounted some of his personal experience in the recent fires. Marian had said that the fire “nibbled at the vineyard” and estate house, but no employees lost their homes. Henrik had another story to tell: having been through the Napa fire in 2008, it had taught him well. After waiting nine days, instead of the expected two, to find out if his 12 tons of Petit Verdot grapes had smoke taint – they did. In the meantime he was already in the winery, doing pump unders instead of pump overs. Also had to wait 12 days for the road to his Malbec vineyard would open – those grapes are all okay but he did end up losing two blocks. None of the Acumen family lost their homes. However, during the fire they were in the midst of a night harvest. There were six pickers that were in the vineyards when the fire came too close. Using their headlamps they were able to get the attention of a passing helicopter and all were rescued. Henrik was allowed to be a “volunteer firefighter” and was amazed at what he saw. Our founding Acumen team of winemaker Denis Malbec and viticulturists Garrett Buckland were drawn to the mountainside vineyards of Napa Valley’s eastern slopes, which have created countless world-class wines. It was here in the rugged Atlas Peak AVA where we set our roots in two unique vineyards with a total of 116 organically farmed acres. The Acumen labels share a glimpse of the inspiring views from our vineyards, both of which have an Old World feel, with bucolic rolling hills and textured rows of mountainside grapevines, surrounded by chaparral and sagebrush…read more. I’m a fan of The Farm Winery wines. In reading their latest newsletter it made me think: I find so many people either don’t know that winemaking isn’t all glamour and/or they really don’t think about or appreciate what work goes into every bottle. The latter is probably the most pervasive and is why I will sometimes do a One Bottle Post to give that winemaker the credit they deserve for all they put into every single bottle. This letter explains more of what they go through. I have not written for a while. So to honor those of you who have asked for a write up – here it is! Nine years ago – 2008 – Arden, our last child steps into the college campus and suddenly my whole world grows sharply small. I am no longer the pivotal force or a need for the three grown kids. Instead, pitifully hurting that I was returning to an empty house, a reconnection with a husband who was traveling for work and learning to adjust to a world with no school schedules of any kind. Smart women have known to get back into the work force or not give up work entirely, but I did and do not think I could have been a good mother had I opted to do both. I made the right decision for me. And then the crazy notion to make wine – similar to having a fourth child – what did I even know about wine? I drank average stuff and on occasion, a good bottle would knock my socks off. But I did not think I would be learning to make the vino. Or that it would entirely change my whole life. That making wine is one thing but I would be out selling it as well – I thought hey, this is seasonal, I will work my buns off for all the wine work and then return to a life that allowed volunteering and some down time. Which brings me to the two worlds that I live in. A candlelit dinner. A beautiful menu. A dashing sommelier describing the regions and the wines and the stories of the winemakers. A choice is made. Wine arrives table side at the right temperature. Decanted flawlessly. You swirl, you breathe in the aroma, you wonder at the gorgeous color, you swirl again, sip once, twice….you know you have the perfect wine for the night, conversation moves in easily and the wine is making all the elegant moves to let you relax and enjoy. You can feel the story in the wine – you pick up the bottle, you note the label, you remember an evening that started with just the wine, but now you are becoming part of the wine story and you memorize the wine to make that evening happen again. Glamorous. Elegant. Classy. A validation of a wine well made. The satisfaction of knowing that both the customer and the winemaker are lost in the making and drinking of the wine. You wake up at ungodly hours – it is freezing and you can barely see but you are at the vineyard before sunup! You have piled on lots of sweatshirts, perhaps two pairs of socks with thick boots. You make a fast run to the privy, take a quick sip of that coffee and you are on your way. A crawler – a piece of machinery that runs between the rows in the vineyards – this crawler has steel wheels – it can make it through very steep slopes, loamy, sandy soil – but it crawls – hence called a crawler. You get on the side of it whilst huge bins are set behind it where the fruit (grapes) are going to be pruned, put into small bins and then transferred over to the large ones on the crawler. You begin your first sort – remove the dead leaves, anything that is not a cluster of grapes and you work fast since the small bins come in rapidly. Who would have thought the fruit would be icy cold….but wow, they are and working gloves are a mercy. Mind you, as you are bending forward to sort, the vine canes are slapping your behinds because the rows are narrow. The front of the crawler is blasting the dust and dirt clearly into your face, the hands are semi frozen but still working, the backside is whipped. Hours later, you get off the crawler – you are stiff, you know you lost parts of you, but dare not think twice. Speedily you get to the winery where the second sort happens which is comical like I Love Lucy trying to pick out the damaged chocolates on a fast-moving sorting table. Let me be clear here. Nothing, absolutely nothing we do at the winery is easy. It is back breaking work. Setting up the destemmer (machine that removes stems in one direction and throws grapes on the table), or the massive hopper that first gets all the clusters….each of these equipments has to be meticulously washed – these are massive machines – you climb ladders (not the light ones – hefty ladders) to wash. Then you learn to use clamps and gaskets and hoses that are so unwieldy and heavy….you make a mistake here and you can have all the wine leaking out. When we are thoroughly pleased with the fruit sorting, we clean out tanks and totes and start the fermentations. Once again, you are squeezing into the small opening of the tank to connect hoses, cages and valves. We double and triple check that nothing will leak. That everything was sterilized with hot water. Then every day of the fermentations, you are keeping track of the brix, the alcohol, the warmth of the tank, the acidity…..for six straight weeks – it is Groundhog Day because each vineyard and each block gets its own time to work itself into a beautiful wine. Winemaking is demanding – no short cuts, giving time and attention to every detail for every wine we make. Mistakes will show up sooner or later so doing things thoroughly and tending to it non-stop, will make a wine that will be stunningly good. Like making time to raise kids and putting in the necessary work and then they are these wonderful adults! Shoulders are shot, hands are scraped or is arthritis setting in, wrists are aching, elbows start misbehaving, feet take a punishing ache, yellow jackets find a way to sting body parts that are covered. There is absolutely zero need for a watch – eating breakfast at 2 pm or missing it altogether – dinner could be a hopeful trip to town, but otherwise what we can make do with because we get home utterly zonked. This year, three of us did the key work and frankly if you put the three of us to make one body that functioned well, that would be asking too much. So, what have I gathered from nine years of doing this? That I will do it again. That it will not get easier. That I enjoy a well-made wine and so very much appreciate what it takes to make it. That I would like to feel during harvest that the woman who goes into it does not come out of it looking like an unkempt creature but alas, wine work is about work, hard work and the fine elegance in World One is simply because World Two knocked itself out to make it. That, when we rarely introduce our wines to the public, they make me weep with happiness for they often validate that the work we do shows up in their glass and they simply love them! 2017 is happily in barrels – time to recoup and mend and get ready for 2018! 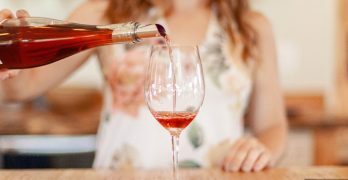 With a geographical size similar to the US and distinct climates, soils and terroirs, its no surprise that Australia boasts an array of wine styles, regions and grape varieties for you to experience. This was an intriguing teaser to a recent Australian wine event I attended. 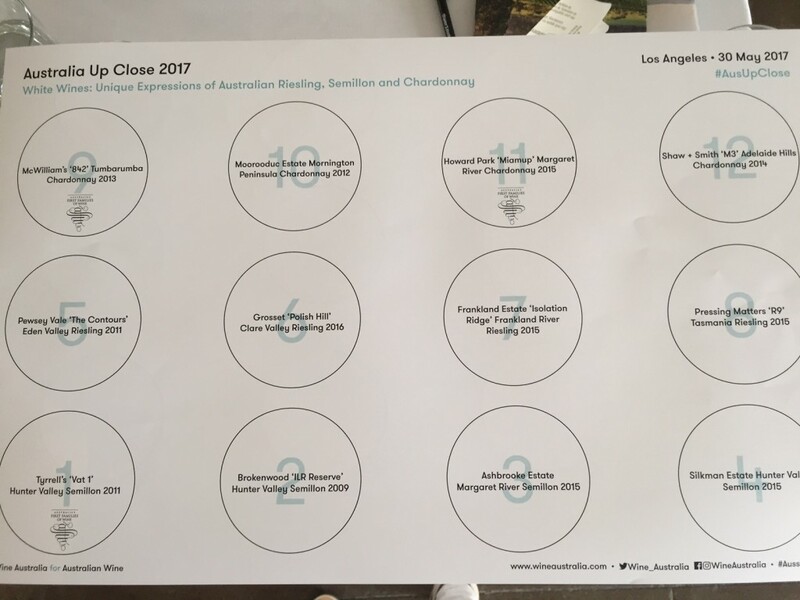 I went in knowing very little about Australian white wines so I signed up for their seminar, and then knew I would enjoy the walk around tasting to get my fill of the wines I was more familiar with: Shiraz, Cabernet Sauvignons and many Bordeaux and Rhone blends. Australia is blessed with regions and climates that can produce truly world-class wines from the noblest of vines. Discover the many exciting expressions of Riesling, Semillon and Chardonnay being produced across Australia’s diverse wine regions. Presented by special guests and winemakers, and moderated by Wine Australia. Fahara Zamorano – Head Sommelier, Gwen LA; Matt Kaner – Owner, Bar Covell & Augustine; Kyle Meyer – Wine Exchange; Bruce Tyrrell – Tyrrell’s Wines; Jeff Burch – Howard Park Wines; Jeff McWilliam – McWilliam’s Wines; Mark Davidson, Wine Australia (Moderator). Tyrrell’s Vat 1 Hunter Semillon Hunter Valley 2011 – Green apple, pineapple lemon zest, Mandarin orange and white pepper all on the nose; with lemon-lime, bruised apple and a medium acidity on the palate. 90 Eve pts. Brokenwood ILR Reserve Semillon Hunter Valley 2009 – I smelled apple, pear, fresh lemon, pears in light syrup; then tasted bright and tangy fresh fruit – same as those I found on the nose. 90 Eve pts. Ashbrook Estate Semillon Margaret River 2015 – Perfumy aroma, then bruised yellow apple, cream and a pale hint of cinnamon; viscous on the mouth, as well as slightly paler fruit and a long finish. 90 Eve pts. Silkman Estate Semillon Hunter Valley 2015 – Lemon, toast, grapefruit and unsalted butter on the nose; followed by tart apple and limeade on the palate. 90 Eve pts. Pewsey Vale Contours Riesling Eden Valley 2011 – Fruit cocktail, green grass to yellow hay, floral and bright; that same bright quality came through on the taste as well as lemon, grass, acidity, bone dry. 90 Eve pts. Grosset Polish Hill Riesling Clare Valley 2016 – Bright aromas of pears and kiwi fruit; followed by lemon, orange and steel on the palate. 90 Eve pts. Frankland Estate Isolation Ridge Riesling Frankland River 2015 – Green apple, crushed green leaves and a whiff of orange on the nose; the palate was very sharp citrus fruit: lemon and orange, a slight viscosity and a long dry finish. 90 Eve pts. McWilliam’s 842 Chardonnay Tumbarumba 2013 – Fresh oak, honey, barnyard, earth, citrus, butter and white pepper on the nose; then the taste was tart, some oak and apple. 91 Eve pts. Moorooduc Estate Chardonnay Mornington Peninsula 2012 – Earthy, dried apple, butter, clove and steely; then bruised apple, tart with medium acid. 90 Eve pts. Howard Park Miamup Chardonnay Margaret River 2015 – Toast, lemon, cream, and a general feeling of being in a sweet floral garden; the flavors were bright, tart and citrusy with a medium acidity and long finish. 89 Eve pts. Shaw + Smith M3 Chardonnay Adelaide Hills 2014 – Creamery butter, lemon and green fields; then that same lemon on the mouth, but light, and a leaner acidity. 89 Eve pts. One of our panelists stated that if you remotely expect that a Semillon from Australia would taste like one from Bordeaux, France you would be dead wrong. If you thought that a Riesling from Australia would taste like its German counterpart you would be equally wrong. My tasting notes above probably express this. Australia is considered a New World wine area, however, Meyer would like us to see their wines as truly old world, but with an edge. The vines are very old, the area is larger than Europe and Phylloxera has never hit them. The 12 elite wineries in “Australia’s First Families of Wine” group have several criteria to meet including their dedication to promote Australian wine to the global market, 100% family owned and have to have at least a 20 year vertical. Next week I will run part two of the tasting, the reds I got to try, on June 16 here on this blog. Limerick Lane, while it has been around for a long time, really burst onto the scene when Jake Bilbro acquired the property in 2011 from the Collins Family. The story of the timing of the escrow closing coinciding with bringing in harvest and then the destemmer breaking down is legendary enough that the annual Limerick Lane Hail Mary Syrah is named after it. Jake Bilbro of Limerick Lane Cellars. Bursting on the scene is what happened though, with immediate recognition from major wine publications that continue to happen, maybe even at an accelerated rate. Not unexpectedly though, as making great wine seems to run in Jake’s family. 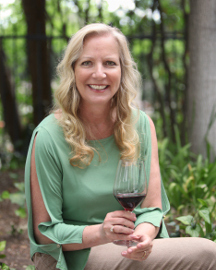 Starting with Marietta Cellars, which Jake’s dad Chris named after his great aunt, Jake and his brother Scot have long worked with their father to make delicious affordable wines that everyone can enjoy, growing the winery to 100,000 cases. When Karen and I last visited with Jake, there were not many wines to taste. Success will do that, especially when you are a small winery of only about 4,000 cases. 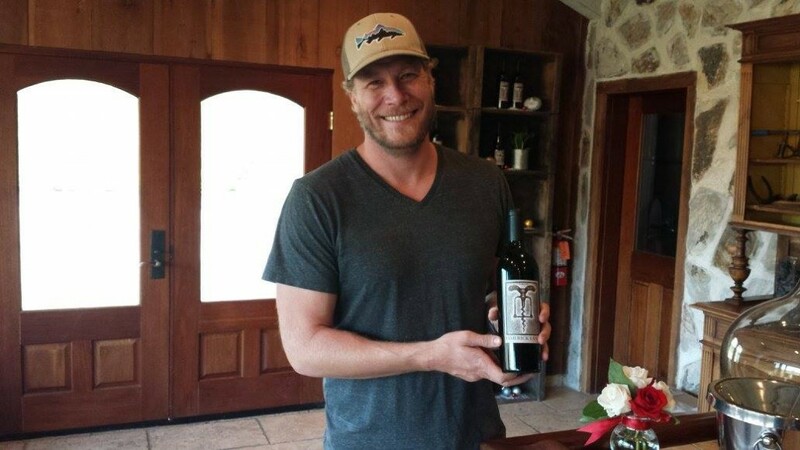 I asked Jake if he planned to expand production given the demand for the Limerick Lane wines, especially with his involvement in last year’s Historic Vineyard Society event and his obvious connection to the great vineyards the organization works to protect. Jake respond that he greatly respects the work that people like Mike Officer of Carlisle and Morgan Twain-Peterson of Bedrock are doing with regard to preserving and sourcing from California great old vineyards. However, notwithstanding the fact that these guys all sell a certain amount of grapes to each other, showcasing the special nature of the Limerick Lane vineyard and the wines it produces is his driving passion and that will be the focus of his time, at least for the foreseeable future. The vineyards actually consists of fourteen blocks, the oldest dating back to 1910. The Zinfandel blocks are true field blends that also include Alicante Bouschet, Peloursin, Negrette, Mourvedre, Carignane, Syrah and Petite Sirah. The Russian River Valley sprawls over a large area, and Limerick Lane is at the Northeast corner of it, with hills providing southern and western exposure. The soil is clay and rock, with the clay holding water and the rock providing space for the vines to dig deep. Cool nights and foggy mornings keep the acidity high and the wines vibrant while the warm afternoons allow the development of intense flavors. Initially planted by the Del Fava family, the property was later purchased by the Collins Brothers in the 1970s. When Mike Collins was ready to sell, he wanted the property to be in good hands, which is why he approached Jake Bilbro. Escrow closed just the day before harvest in 2011. And, to complicate matters, as harvest was wrapping up a few weeks later, the winery’s destemmer broke, with 7 tons of Syrah still to crush. With rain on the way, Jake threw a “Hail Mary” and dumped the grapes, stems attached, into two open top fermenters and hoped for the best. Personally, I love the complexity that stem inclusion can bring, especially to Syrah. And the Hail Mary bottlings from Limerick Lane live up to this trait. From that year on, Jake has made a Syrah labeled Hail Mary to pay homage to that first vintage. We got to taste the 2014 during our visit and it was great as always. 2014 Russian River Zinfandel – from the original vines planted over a hundred years ago. Not your ordinary Zin, the field blend aspect makes this is a complex delicious wine. 2014 Syrah Grenache – it was the 2011 version of this that I raved about along with the RR Zin when I attended Sonoma In The City back a couple of years ago. This continued that tradition. 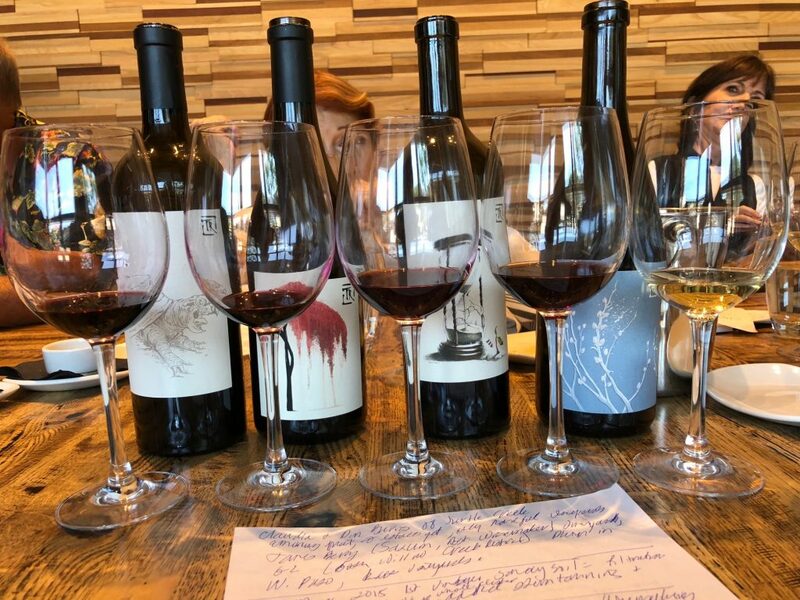 1910 Block Zin  – You’ll rarely see specific tasting notes from me, but in this case it was just too obvious; it was just like fresh blueberries! Wonderful wine! 2014 Rocky Knoll Zinfandel – another field blend, with Mourvedre and Petite Sirah that give this wine wonderful structure. These wines get very high scores from the wine publications. Production is small and the wines are very hard to find outside of the tasting room or the mailing list. Go see them. There should be new releases to taste, but don’t wait too long. See photos of our visit to Limerick Lane and others from our trip here: Sonoma County Series. Last week’s article was about the seminar that kicked off the latest Rhone Rangers event in Los Angeles. 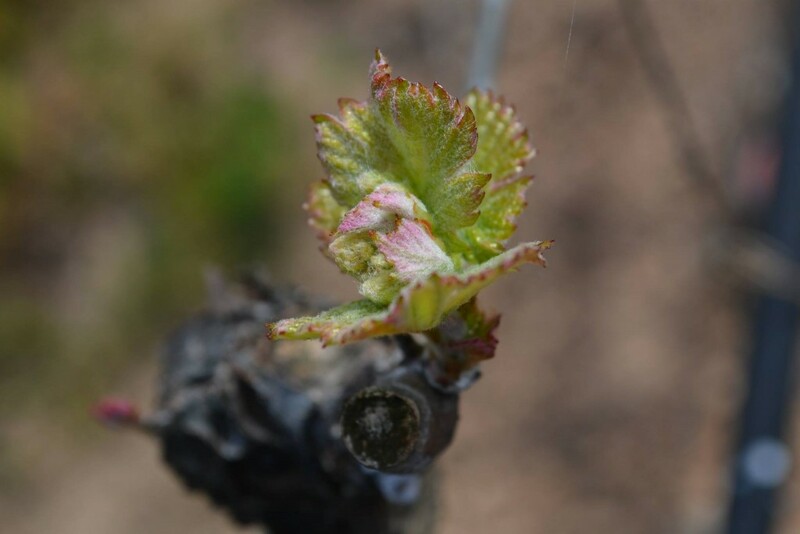 Bud break, photo courtesy Rhone Ranger Facebook. I was determined to get to some new wineries along with some old favorites. With that many wineries, I couldn’t taste nearly everything. So, before I begin my personal picks from the event, I’d like to preface my remarks. More than maybe any other event, the Rhone Rangers tastings have always impressed me with the overall high quality of the wines being poured. My point is this. I tasted at less than half of the tables and found amazing wines at pretty much all of them. I am quite sure that if I had tasted at the other half of the winery tables, I would have found an equal number of outstanding wines at those stations as well. That being said, these were the standouts for me of what I tasted – once again, please pardon the lack of diacritical marks on the French words. I’ve added a few comments here and there, along with a few from my wife Karen as well, noted as KP. KP: Bonny Doon’s 2016 Picpoul was an even balance of bright acidity and minerality. My favorite white of the day. KP: I dragged Michael over to the Derby table. I enjoyed all their white wines and loved their 2015 Mourvedre Rose. Light, refreshing and clean on the palate. It was one of my favorites of the day. KP: I tasted the Petrichor 2016 Rose Blend. Subtle and very enjoyable. KP: Amy’s 2015 Chrome, Grenache Blanc, knocked me over. It has wonderful mouth feel and bright apple overtones. Stopping at Zaca Mesa helped to remind me, and I am now reminding you, to check out all of these Rhone Ranger wineries. They’re making wonderful, delicious wines and deserve your attention. A couple of weeks ago I received a special invite, from LearnAboutWine.com founder Ian Blackburn: “Tastemakers, Sommelier and Press, please accept my invitation to a special press gathering for the STARS of California Wine.” And that was enough for me to send off my rsvp right away. I knew from a previous luncheon that the meeting – very intimate with a little over a dozen of us in attendance – would be stellar, the restaurant would be remarkable and the wine, presented by a winery representative or owner, chosen with care. This time we met at a penthouse private room in the TAKAMI Restaurant, in downtown Los Angeles. Our wine representatives included Larry Schaffer, winemaker and owner of Tercero Wines; Timothy Carl, the managing director of Knights Bridge Winery; and Michael Young, the sales and marketing director of L’Aventure Wine. On this occasion, however, I enjoyed Larry’s wines with three Robatas: Angus New York, Chicken Negima, Chilean Sea Bass; and then a selection of sushi rolls. For me, I prefer to make tasting notes sans food. But, in real life, this is how we do it – and it was very enjoyable to sit back and just enjoy as my tasting notes had already been done. The rest of the guests, some new to Larry’s wines, remarked that they really enjoyed them and what he has accomplished with Rhone varietals. 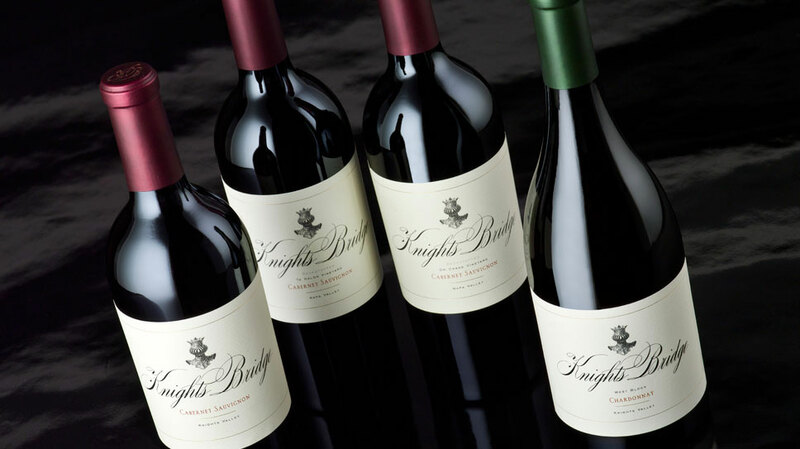 When Timothy Carl introduced Knights Bridge he explained that his family has ten generations of grape growing experience. They only produce Sauvignon Blanc, Chardonnay and Cabernet Sauvignon in their vineyards about five miles Northwest of Calistoga. The stand out wine for me was Carl’s 2008 Knights Bridge Pont Chevalier Cabernet Sauvignon filled with blackberry, lavender, cassis, and minerality in perfect balance. Then Michael Young introduced his L’Aventure “meat and potato” wines to pair with a Grilled Angus drenched in a Black Truffle Sauce…and potatoes. The 2010 Optimus was 55% Syrah, 27% Cab and 18% Petit Verdot. I thought it was a fruit bomb with plenty of spice on the back palate, bold and tannic, a great wine. Young followed it up with the 2010 Estate Cuvee that was a blend of 42% Syrah, 42% Cab and 16% Petit Verdot. Only slightly softer than the Optimus, another fabulous wine. and many more to come…. A very special and rare lecture and tasting with Raimund Prüm, owner and winemaker at the SA PRUM estate in Germany’s Mosel Valley. SA PRUM ranks among the region’s top producers of high quality Riesling. Come join us to learn about the history, geography, style and characteristics of Mosel Riesling. We will taste a special selection of classic wines during the class and a different selection at the lunch/tasting to follow. Ian Blackburn, our host from www.LearnAboutWine.com, introduced Raimund Prüm by stating that Prüm’s Rieslings were not “sweet wines” in fact when Blackburn had visited “the Mosel” he found that white asparagus was in season and was one of many foods that he was surprised that paired so well with Prüm’s wines. Prüm’s family dates back to 1156 in the Mosel Valley, 90 minutes from Frankfurt, and Raimund Prüm made his first vintage on Christmas Eve in 1970 – an Eiswein (Ice Wine). By 1971, after his father passed away, Prüm found himself making wine full time. Forty years later Prüm has produced over a million bottles of wine from his 28,000 acres. Prüm, with the help of a slide show, explained the terroir of the Mosel: Steep hillsides – the highest elevations in all of Germany at 900 feet – and the grey and red slate that can be found layered in the mineral-rich soil. A notable Sundial appeared on one of the slides, the first one was circa 1842, which marked where the best Rieslings, his Rieslings, were grown. Now that sundial has been duplicated in other vineyards, denoting them as the finest. The palest of the line up with lemon, green apple, citrus, very smooth and balanced. The term “Erst Lage” on a label is their version of a “Grand Cru”. Honeysuckle, jasmine, sharper lemony taste, grass, slightly acidic, long finish. Honeyed-grapefruit, white pepper, dried apricot, pear, a tingling finish and not what I considered sweet. An early favorite for me. Green hay, a trail mix filled with flavorful dried fruit, tangerine, round and coating on the tongue. Vanilla, peach, like a 50-50 ice cream bar: orange sherbet wrapped around creamy vanilla ice cream, another interesting favorite. Candied ginger, pineapple, ripe persimmon and balanced with some spice on the back palate. Spice, dried apple slices, golden raisin, tangy edge. Deep burnt orange in color, and from inches away I could smell orange rind and spice rack, getting closer I detected a silkiness, honey and those golden raisins again. Balanced. It was the one word that kept coming up as I sniffed, swirled and sampled the Rieslings. And, apparently, it was on Prüm’s tongue as well. He mentioned all kinds of pairings from cheeses, salads, seafood, pork dishes, filet mignon to Thai food. “These are food friendly wines. Stop thinking red wine and red meat.” In conclusion Prüm said, “Someone once commented to me that my wines have too much balance. Is there such a thing?” No, thank Bacchus, there is not. Family-owned S.A. Prüm, founded in 1911 by Sebastian Alois Prüm, has been in the hands of Raimund Prüm, head winemaker and Sebastian’s grandson, since 1971. Under Raimund’s leadership the property has earned a reputation as one of the most successful wineries in Germany’s celebrated Mosel wine region. The Prüm family has a rich and ancient history in the mid-Mosel. Here they have owned vineyards in the towns of Bernkastel, Graach, Wehlen and Zeltingen since 1156. Today, the estate comprises 40 acres of vineyards planted principally with Riesling. Over 15 acres of S.A. Prüm’s holdings are located within the famed Wehlener Sonnenuhr (“sundial of Wehlen”) domain. Named for the historic sundial painted on an outcrop of slate by a Prüm ancestor back in 1842, the incredibly steep Wehlener Sonnenuhr vineyard is a renowned source of what is arguably Germany’s finest Riesling. Here vines average 80 years and older and benefit from plentiful sunshine – a critical factor in the world’s northernmost wine-producing country. The soil is comprised of layers of finely decomposed, mineral-rich blue slate. Underneath, deep-lying aquifers provide the vines with adequate water during dry periods. S.A.Prüm is a founding member of the Association of German Premium Wineries (VDP), a consortium of Germany’s top producers. Raimund Prüm employs organic fertilization, hand-picking and strict yield control to ensure the utmost quality. Day-to-day operations at S.A. Prüm are a family effort. Daughter Saskia Andrea (another S.A. Prüm) is integrally involved and after working at top wineries around the world, is poised to take over the reins from her father. Jennifer, Raimund’s second daughter, is involved in the administrative side of the business.